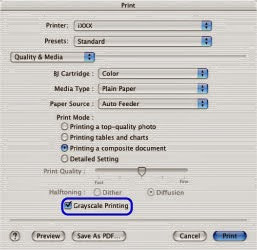 Configure your printer with Mac OS X to print only using the black color, if you need help, write a comment. The procedure for printing using the black ink cartridge Canon printers. Only for devices with Mac OS X systems, if you use Windows as the operating system you should look at our publication printed only in black with Canon printers from Windows. You should know that sacrifice some quality to your documents when printing grayscale, save some ink in the black cartridge and all the ink color cartridge. 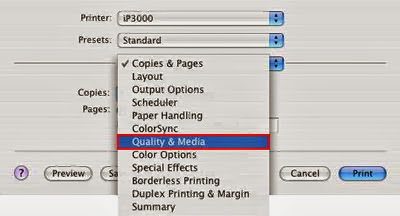 Under Settings select "Quality & Media". Finally click on print to save the changes.